In our last article we looked at sweet ways to come up with blog ideas when you’re stuck. But what about all those awesome article ideas you get at the most random of moments? How do you make sure you don’t lose those nuggets of inspirational gold? 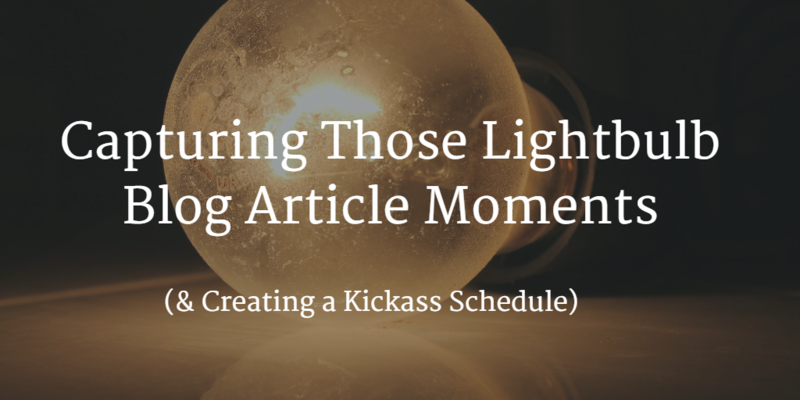 In this article we’re going to look (briefly) at the psychology behind why we get our best ideas at the least convenient moments, and how you can capture those ideas and turn them into a bursting blog schedule. Have you ever had one of those days when you sit in front of the computer, staring at a blank screen and nothing comes? Then on the drive home, or while you’re cooking dinner, or when you’re trying to get to sleep, FLASH – you’re struck by the blinding light of inspiration! Research shows you’re more likely to have a creative epiphany when you’re doing something monotonous, like driving, exercising, or showering (basically anything where you flip into autopilot, as this allows your unconscious to work on something else). Leo Widrich, co-founder of Buffer (who I have a slight crush on – Buffer not Leo, although I’m sure Leo’s lovely), wrote a very insightful article on the subject. He shares a little of the science behind why many of us get our great ideas in the shower, before bed or while exercising. Typical triggers for events that make us feel great and relaxed and therefore give us an increased dopamine flow are taking a warm shower, exercising, driving home, etc. The chances of having great ideas then are a lot higher. You can read the article in full here ‘Why we have our best ideas in the shower: The science of creativity‘. So we know our best ideas often don’t come when we’re in front of a computer, and we know a little bit about why that is. But what can we do about it? It’s vital to have a way of capturing those lightbulb moments when they decide to pop up. I like to fire up the voice recording app on my iPhone and then type it up when I’m next in front of a computer (remembering to use headphones if anyone else is about, rather than inflict the garbled mess of randomness on them!). Oh and don’t worry if your phone is not yet of the smart variety, call and leave yourself a voicemail, it’s just as effective. Other options for when a computer isn’t at hand include; Evernote app (which also has an audio option), any ‘Notes’ style app on your phone or simply good old school pen & paper (check out the Hipster PDA). Always have your best ideas in the shower? Then you need to get yourself Aqua notes for in the shower creativeness! At this stage you only want to get the headlines down; the angle, the inspiration and the winning, can’t possibly not click on, title. Don’t get hung up on the finer details, the grammar or references – you can sort all of that out later, this is just to capture the ideas. So you’ve been storing up your ‘eureka’ blog idea moments. You have audio clips, post it notes, saved documents, heck even the odd tattoo (just like Guy Pearce in Memento – random reference!) – but what do you do with them all? I have to confess to having tried various methods before I found one that worked for me (and not only me, my clients love it as well). In the past I’ve used excel spreadsheets (with columns for; blog titles, dates for the blog to be published, any links and general notes), and I’ve also tried creating separate word documents for each idea and storing them in a blog folder with the intention of dipping in as and when. The problem was that they were static and unlinked. They all required me to go in and constantly update them (without giving me much in return). The fact that I didn’t use any of them consistently was a massive red flag that there had to be a better way. 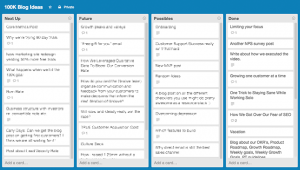 Trello – the better way! And then I discovered Trello. 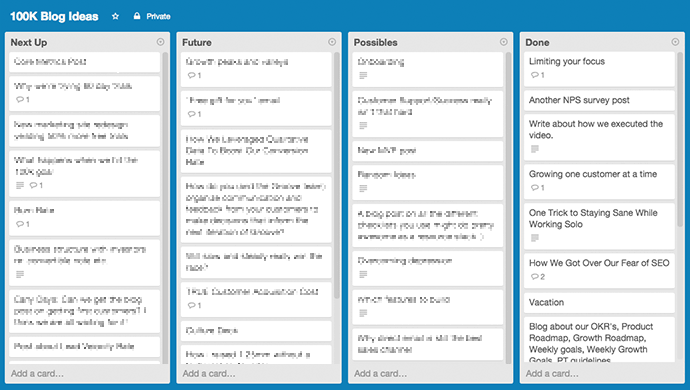 For those of you who don’t know, Trello is a Kanban style board, you have a number of columns and add cards to each column. You can then move these cards across the columns left to right. Each of my clients has their own ‘board’, on that I have a ‘Proposed Blog Ideas’ column, then ‘Agreed Blog Ideas’, ‘ Working on’, ‘Loaded onto site’ and finally ‘Published’. Each blog post has its own card and both the client & I can add them. The board for Spotty is pretty similar, only I don’t have the agreed column, cards go straight from ideas to working on. Trello works well for teams as well. Other team members can add ideas to the board, helpful for getting a different viewpoint or links to related material they find. When you start writing you can attach the document to the card and get feedback to ensure you’re going in the right direction. In fact they have an awesome article explaining how they come up with 15+ posts a week (I’m waiting for the one that explains how you find the time to write that many!) which looks at Trello, as well as a really handy keyword research tool. Of course, if you have a WordPress blog, then you can add your ideas straight into the site. “I type it as a headline in WordPress. Then, when I am ready to blog, the draft area reads like a list of ideas. Works for me.” — Mark Schaefer, college educator, author, speaker, and consultant. “Typically what I do is as I am surfing I will come across an article that will spark an idea for a blog post. Then, before I forget it, I will go to my WordPress dashboard and create a new post with a title describing the post, and in the post I will write some quick notes about what I want to talk about and a link to the article I found. Just so I have it down and then later I will come back when I have time and write out the post.” — Mack Collier, social media strategist, trainer and speaker.